In a statement sent to PCWorld, Microsoft avoided using the term “overheating,” but said users should expect the Core i7 model to run warmer than its less-powerful siblings. But what about users who've experienced a temperature warning icon on the screen? Microsoft said a software bug is actually triggering this warning by accident, and only on a “very small number” of Core i7 models. It's possible that some of the heat issues—which users said would occur even during light computing tasks—are related to Windows updates that Microsoft applies in the background. As Neowin reported earlier this week, some users managed to cool the system down by killing Windows Installer Module and Windows Installer Module Worker in the Task Manager. 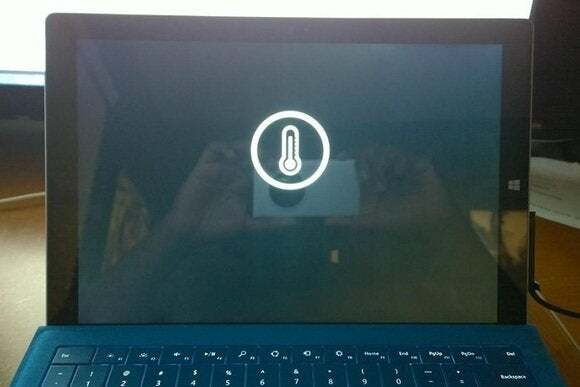 One user told me that his Surface Pro 3's heat issues went away after the system installed its initial batch of updates. Still, if you'd rather have a Surface Pro 3 that's cooler to the touch, and don't mind sacrificing some computing power, you may want to stick with the Core i5 model, which is considerably cheaper anyway.